In this window ReclaiMe Pro displays all the devices and disk images along with all the found partitions. All these devices are grouped in a certain way. Bold - something which is likely to be a primary user data store from a NAS is highlighted with bold font. Red - objects which are not readable (RAIDs that have not enough disks) are colored red. In most cases, you should not attempt recovery on these objects. Amber - RAID objects that have missing disks but can still be reconstructed by appropriate RAID redundancy (mirror or parity), are colored amber. To select one device, mark the checkbox next to it. To select multiple devices, mark multiple checkboxes. If you collapse the complex partition, like MD or LVM RAID, all the checkmarks of the underlying objects will be removed. Generally, invisible object cannot be checkmarked. Depending on the number of the selected devices, different actions are possible. Start scan. Enabled only if one device is selected. Once you click it, ReclaiMe Pro displays the window where you can set the parameters for filesystem recovery. Start RAID. Enabled if at least two devices are selected. Once you click it, ReclaiMe Pro displays the window where you can set the parameters for RAID recovery. VHDX – use to create an image file if the source is larger than 2TB. Sector-by-sector image size always equals to the original disk size. VHD and VHDX disk images do not store zero data and so can be smaller than the original disk. The 2TB limitation of VHD format is applied to the original disk size rather than to the resulting VHD file. Once you select what image you need and specify where to save it, the window appears where the progress information along with runtime settings are provided. More information. Manual region. Enabled only if one device is selected and allows you to specify the region name, start, and size. Note that you can create a region till the end of the underlying storage. Once the region is created, ReclaiMe Pro adds it to the device list right under the parent device. Regions can be used equally with the partitions obtained from the various partition schemes. Read more about manually specifying regions and RAIDs. Manual RAID. Switches to the window where you can manually create a RAID by providing RAID parameters. Read more about how to create a RAID manually. Find partitions. Enabled only if one device is selected. When you click the button, ReclaiMe Pro starts searching the selected device for partitions. 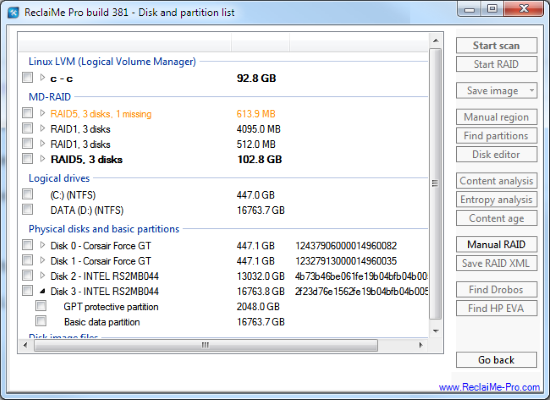 All the found partitions are displayed in the new window along with detailed information. Read more about ReclaiMe Pro partition recovery. Disk editor. Enabled only if one device is selected. When you click the button, ReclaiMe Pro opens the Disk editor window. More information about disk editor capabilities. Content analysis and Entropy analysis. These buttons are enabled when you select at least one device. During content analysis, ReclaiMe Pro collects the statistics about disk content (bad sectors, zero sectors, and so on), and builds a mirror map and calculate parity if you select more than device. Read more about content analysis. Entropy analysis provides information about data entropy depending on the block size and number of disks. This allows you to get additional information about RAID parameters for RAID5 and RAID6 layouts. More information about entropy analysis. Save RAID XML. Saving the RAID configuration to an XML file is possible only for RAIDs created manually (using Manual RAID capability) or for RAIDs recovered automatically (using Start RAID). Find Drobos becomes active when two or more disks are selected. When clicked, launches Drobo BeyondRAID recovery process involving collecting metadata remnants on the specified disks, reconstructing Drobo configuration parameters like disk order and Drobo chunk locations, and rebuilding Drobo LUNs based on the recovered configurations. Read more about Drobo recovery on this page. Find HP EVAs is enabled when at least two disks are selected. Clicking the button launches extended search for HP EVA vRAID metadata on the selected disks. During the initial scan, ReclaiMe Pro collects and then displays information about all the possible HP EVA LUNs found on the disk set. Once you specify LUNs for recovery, ReclaiMe Pro starts applying more thorough (and slow) recovery algorithms to the LUNs aiming to reconstruct HP EVA LUNs parameters like vRAID stipe size, disk order, vRAID LUN sizes, and other. Read more on the HP EVA recovery page.